Kai Monroe leading a tight pack into Crash Corner. Firstly, I’d like to quickly introduce myself before I tell what went down in “corntown”, Ohio. My name is Nathan Bailey and I am a downhill skater from West Virginia. West by god (what we locals call West Virginia) may be wild and wonderful, but it lacks a downhill scene. Thus, the few downhillers that are here must hike elsewhere when hankering for the sweet pleasure of a DH event. But us skatin hillbillies ought not fret too much cuz Soldiers of Downhill is just a skip and a hop across the river in Bainbridge, OH. 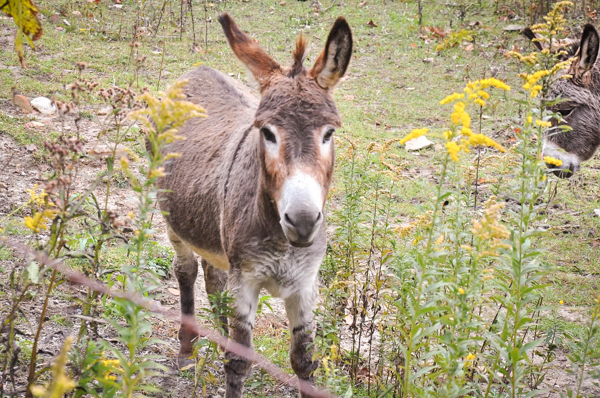 So for the second year in a row I saddled up my donkey, hopped in my cart, and headed for the hills. . . or at least the other hills. The Soldiers prepare for battle. Max Wippermann keepin’ it tight. I hope all that description gave you a gnarly picture of the course in your head, though it probably isn’t even as gnarly as it actually is. Dan Arney (red helmet) trying to squeeze into first. Riders enjoying their trip up between heats. Caitlin Yong and the ladies surfin’ the chicanes. 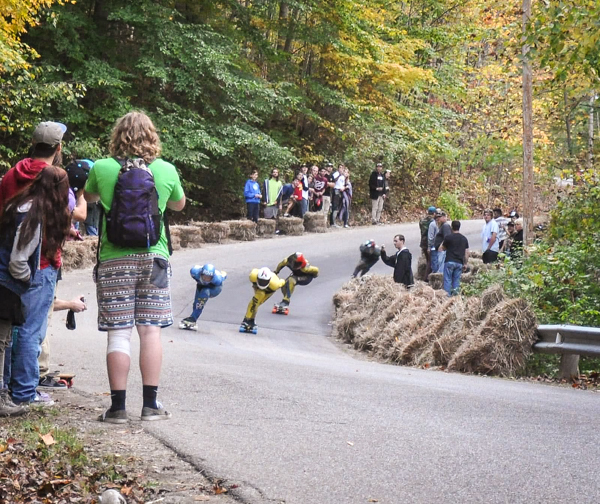 Action Boardshop and the rest of Michigan Downhill came out in full force this year. Loryn Roberson of Action even won the women’s division! Action’s Peter Croce layed down the funky beats as the resident DJ during the party and at the end of practice day. 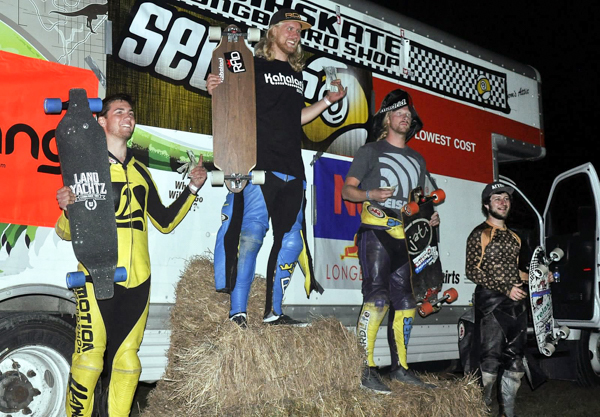 The rest of the local riders all did very well with Action team rider Matthew Deitch snatching 4th in finals. Up and coming Six Four rider, Drew Hafner, leanin’ through Crash Corner. Eddy G. throwin’ down for Yokecrew. Crash Corner being Crash Corner. Thor, leadin’ the pack in the semis. Final four coming hot out of the chicanes. Lastly, I really want to encourage all you skaters reading this to make sure to Get Rad or Get Lost! It’s important. Ha ha! Skate hard and keep on tucking, go fast or get last, but most importantly have fun. I hope to see you at next year’s Soldiers of Downhill! The boys stokin’ on the Open Podium. A big thanks to Ohio Downhill Skate, Dan Oliver, the on-staff paramedics, the event course workers, the volunteers, the town and community of Bainbridge, all the event sponsors: Phat Deanz, MuirSkate, Orangatang, Team NoBull, Pantheon, RAD, Sector 9, Gullwing, Detroit Bearing Co; and a huge thanks to Nathan Bailey & Austin Michels for sharing their words and images with us here at Wheelbase showcasing their experiences from this year’s Soldiers of Downhill. Thumbs up all around! 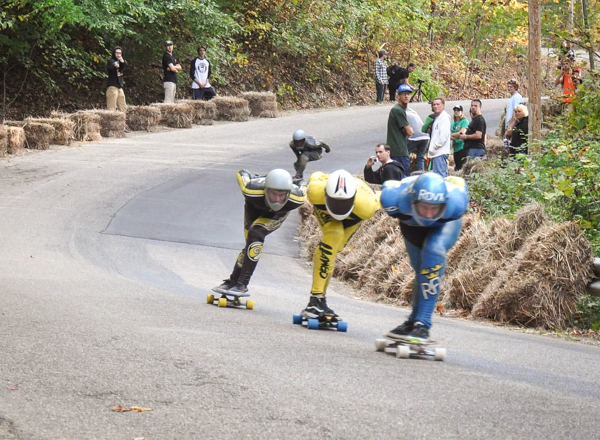 Soldiers of Downhill 2014 with MuirSkate Grand Rapids Urban Downhill, 2014 Soldiers of Downhill 2012 (Ohio): October 20 & 21 Soldiers Of Downhill: Open Registration.